German Chancellor Angela Merkel upholds the idea of the decentralization of power in Ukraine as a path to resolving the ongoing conflict in the east of the country, she said while on a visit to Kiev Saturday. Merkel said that Berlin backs the Kiev-proposed plan on decentralization as an important step needed to let Ukraine’s Russian speaking population feel more involved in the country’s affairs. “What we [in Germany] mean by federalism is called decentralization in Ukraine. And that is what President [Petro Poroshenko] wants,” she told a joint media conference following the meeting with the Ukrainian leader. “It’s an important step to make the Russian population feel part of Ukraine and stay within Ukraine,” she said, as cited by RIA Novosti. 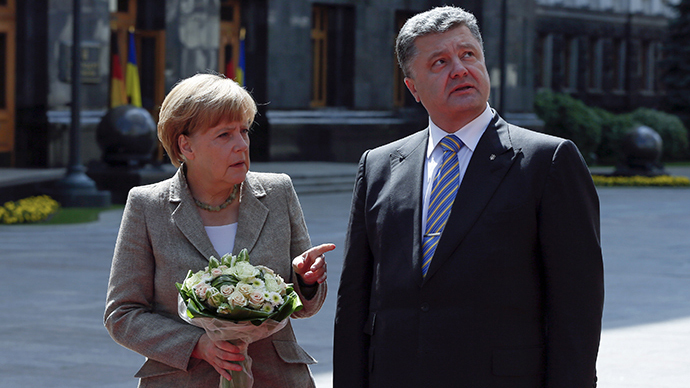 In Merkel’s view, Ukraine should proceed with the decentralization plan. However, she noted, appealing to Germany’s experience would be wrong as there are certain difficulties. What Germans understood by federalism was seen very differently in Ukraine where it was linked to a greater degree of independence “that we don't want at all,” she said, according to Reuters. Merkel’s comments came shortly after her Vice Chancellor, Social Democrat Sigmar Gabriel, spoke out for federalization to be introduced in Ukraine once the conflict in the east of the country is settled. “The territorial integrity of Ukraine can only be maintained if an offer is made to the areas with a Russian majority,” Gabriel said in an interview with the Welt am Sonntag newspaper which coincided with Merkel’s visit to Kiev. “A clever concept of federalization seems to be the only practicable way,” the politician said. However, he added, a ceasefire should first be agreed. Gabriel, who is also the Economy Minister, was one of the first German top-ranking politicians to suggest federalization as a solution to the Ukraine crisis. 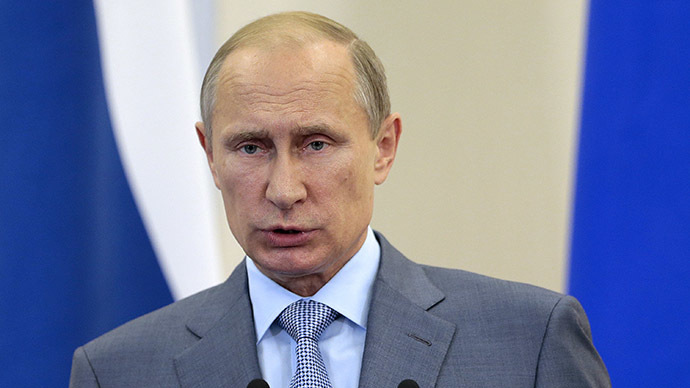 His comments came as surprise to many in Kiev as Poroshenko earlier ruled out such an option for his country. According to Merkel, however, he meant what Ukrainians understand as decentralization. 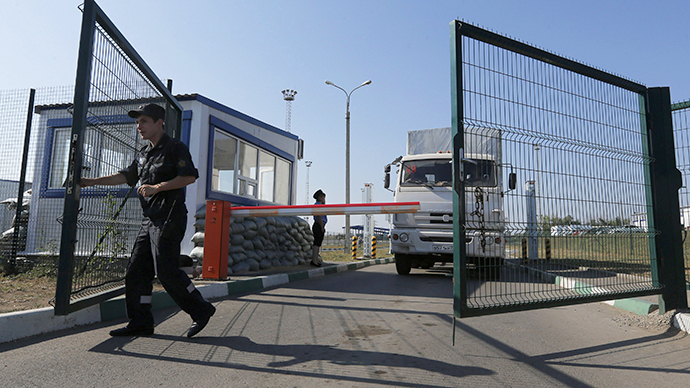 The Chancellor’s visit to Ukraine comes on the heels of a fresh round of tensions between Kiev and Moscow over the Russian humanitarian aid convoy which delivered food and other necessities to residents of the Lugansk region devastated by ongoing violent fighting. Moscow’s decision to order its convoy to cross into Ukraine Friday without Kiev’s final approval triggered fierce criticism and accusations from the Ukrainian government and its western supporters, including the EU, the US, NATO, and Germany.Russia hit back accusing opponents of “hypocrisy” and maintaining it acted strictly within the frameworks of international law. Merkel’s plane landed in the Ukrainian capital Saturday as shelling in the east of the country continued, bringing new casualties among civilians, destruction and the worsening of the humanitarian disaster in the south east. Opening the meeting with the German leader, Poroshenko called her Ukraine’s “good friend” and “strong advocate.” He said they’ve spoken over 20 times within past two months, which helped Kiev “protect its interests,” the presidential website reported. On the results of the talks, Merkel pledged that Ukraine will get 500 million euro (about $660 million) credit guarantee to restore infrastructure in the war-torn eastern regions. An additional 25 million will be allocated to help refugees from the regions hit by the violence. Poroshenko said that he is set to submit to parliament for ratification a Ukraine-EU Association agreement signed in late June. 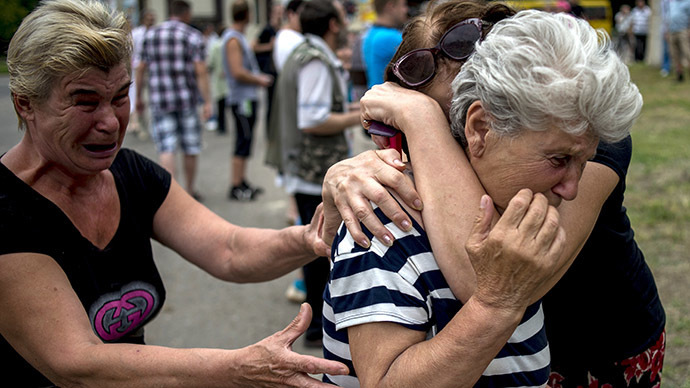 The pact has played a central role in the conflict that led to months of violence in Ukraine. Protests, that later resulted in the ouster of President Viktor Yanukovich, began after he refused to sign the agreement fearing that Ukraine was not ready and the association could harm national interests. Both Merkel and Poroshenko said they had high expectations for the upcoming talks between representatives of Ukraine, the EU, and the Customs Union (Russia, Belarus, Kazakhstan) on August 26 in Minsk. Merkel and Poroshenko said they hope the meeting will yield positive results.